Got this news from Twitter. 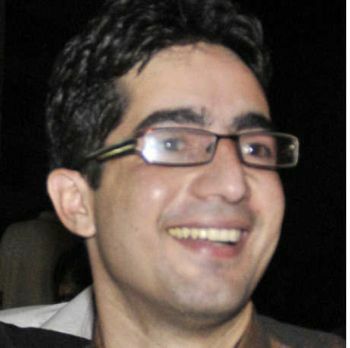 @FreeKashmir reported that Dr. Shah Faesal from Kashmir topped the IAS, and was complaining that “the news didn’t make it to the Indian media”. It would indeed have been surprising and disgusting if Indian media had ignored this, so I immediately googled the topic, and there it was — on Times of India, Hindustan Times, Indian Express, The Hindu — in each case prominently on first page. Well, this particular blogger likes to complain a lot, so this tweet was not much of a surprise either. We celebrate our heroes, sir, irrespective of what region and religion they come from. Yes, at times Twitter may be faster than conventional websites and newsprint. It has been reported that Dr. Faesal belongs to Sogam in Kupwara district and his father, who was a brilliant school teacher, was killed by unidentified gunmen in 2002. He later attended Biscoe School and Jhelum Valley Medical College in Srinagar, Kashmir. Really an inspiring story. Anyway, congratulations Dr. Faesal, I am sure you will make your state and your country proud. Let other people keep dreaming of Pakistan. Those who rise above the petty politics of religion will prevail. Hopefully. You are right Raman Ji, some people will compalin no matter what. They will not appriciate the fact that everyone has got equal opportunities in India. well we people dun dream of pakistan..actually indians and pakistanis are of same blood ..so no way we gonna degrade our standards tat is kashmiri standards..i suppose kashmiri pandits are very much happy with indian bengalis and biharis ..so may god keep kashmiri pandits and these biharis together forever..and may god flush the indian army out of kashmir and make kashmir a an independent and successful nation ..amen!! Actually I have personally seen the “Kashmiri standards” you are talking about. Rich/poor, literate/illierate people are among Biharis/Bengalis as well as they are among Kashmiris. If you compare the overall achievement of Bengalis or even Biharis, Kashmiris will stand nowhere. Skin color is not everything. Also, if you have special blue blood, different from Indians and Pakistanis, then please talk about Kashmir only, not about Dogras and Ladakhis, or even Gujjars or Dardis. If “God” were to flush Indian army out of Kashmir, then He would not have brought them into Kashmir in the first place. Who knows what “God” really wants?